Originally an acronym for Radio Detection and Ranging, the acronym has since merged with common language and is now rarely seen in its all upper-case form. Radar is used for gathering information about distant objects, usually the movement of aircraft, weather systems and objects in Earth orbit. Additional uses include space-based mapping of the Earth and other objects in our solar system. A radar system works by transmitting radio signals that reflect off objects in their path and are captured by a radar receiver where they are displayed on a radar scope ( pictured left ). 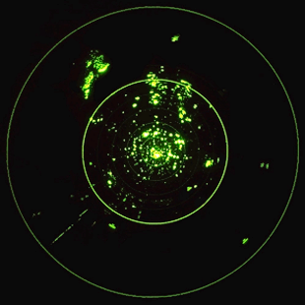 Only about one billionth of a billionth of a radar signal gets reflected back. Therefore radar systems must use very powerful transmitters and very sensitive receivers. Consequently, although the development of the radar had begun around 1904, it was not until 1935 that technology advanced far enough to make a viable radar system. The first radar systems could detect any aircraft within 100-150 miles, but were unable to detect objects flying under 500 feet, hence the expression, "flying below the radar". Early systems also detected and displayed everything that reflected a radar signal, requiring the operators to interpret the various returns and manually separate the aircraft from the clutter and other anomalous signals, which sometimes included UFOs . Modern air traffic control radar uses transponder and anti-clutter technology that filters out anomalous and irrelevant returns so that operators can focus on the commercial air traffic. Unfortunately this means that UFOs no longer show up on civilian radar unless the filters are switched off, and there is usually no reason to do that unless a pilot reports a UFO to air traffic control. However commercial pilots are sometimes reluctant to report UFOs out of fear of ridicule and the associated fallout that could affect their jobs. military radar can be set to not filter out anomalous signals. In contrast, advanced military radar stations routinely monitor everything and are so sophisticated that they can detect individual features on a target and create a picture that can be matched with a database of known aircraft types. With such advanced technology, it's a foregone conclusion that the military knows much more about UFOs than the public has been led to believe. In his classic book The Report On Unidentified Flying Objects, Edward J. Ruppelt asks: "Does a UFO have to land at the River Entrance to the Pentagon, near the Joint Chiefs of Staff offices? Or is it proof when a ground radar station detects a UFO, sends a jet to intercept it, the jet pilot sees it, and locks onto it with his radar, only to have the UFO streak away at phenomenal speed?"